The Heavy Duty Sink is the upgraded workhorse of the Cashel Utility Sink line. This is a versatile, extra-strength laundry tub that will handle everything you can throw at it. Made to be durable, this free-standing sink will last. Customize for your home: Available in white or granite, with plastic legs or heavy gauge steel, or a Fully Loaded Kit with all the bells and whistles, or tailor an Essential Kit at home with the faucet and plumbing of your dreams. The Heavy Duty Sink is a tough tub designed for hard work. With a large 20-gallon capacity, the Heavy Duty Sink will easily fit into your laundry and utility rooms. The Heavy Duty Sink will also fill workspaces in the Garage, Pantry, Workshop, Greenhouse, Studio, or Workshop. Further, the Heavy Duty Sink utility tub has two self-draining soap holders. 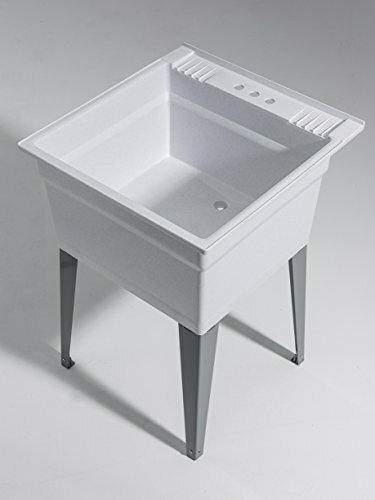 Great for wet or dry environments, this laundry sink is stain and rust resistant, too. The Heavy Duty Sink always comes with an American made basin and four legs, in either injected molded plastic or heavy gauge steel, leg levelers, and drain accessories like the bottom nut, stopper, and strainer. The Fully Loaded Sink Kits come with everything else you need: 4-inch pull out chrome faucet with two spray settings, supply lines, and down plumbing, even Teflon tape! You only need common tools to assemble and install the Heavy Duty Sink.